Everybody wants to be fit. Who doesn’t? But the most obvious reason why someone isn’t is because it’s tough. It’s difficult even to follow a balanced diet, leave alone exercising. You will end up eating junk foods for some reason or the other. Exercising might not be the easiest thing to do, but it is the only way to get into shape. There is no different way out. You need not spend hours together; you just need to do it the right way. They just need to be done smartly so you can get the best out of it. People laugh when I tell them that you can lose weight or gain muscles by doing standard exercises like running, pushups or sit-ups. It’s easy, just put on a weighted vest, and the normal exercises become tough again. Weighted vests help you to get more out of the same exercise. Though there are thousand of a weighted vest to choose from online, there are very few for women. In a male dominated industry, it becomes very hard to find a good weighted vest for women. After a lot of research, we have for you some of the best weighted vest money can buy for women. Some are specially made for women while some are unisex in type. Why women need a different weighted vest ? You might be wondering why should I buy a different weighted vest specially made for a woman, can’t I use the other ones. A woman’s body structure is very different when compared to that to of a man’s. It will look quite gross to see a woman wear a man’s weighted vest. Not only looks but comfort and efficiency also matter here. You need results too….right! These women find it hard to gain weight and build muscle mass. They have mostly a fast metabolism. These women gains muscle easily and gains fat more easily than ectomorphs. These women find it hard to lose fat and have a slow metabolism. Muscles are mostly not so well defined. Selecting a weighted vest for a woman might be easy. Make sure to select a weighted vest according to your body structure. Also, the type may differ depending on if you are a beginner or a professional. Note- If you are not sure, which body type you fit in, make sure to consult a doctor. Weight distribution is crucial while buying a weighted vest for yourself. Unlike a man’s body, the women’s have additional curves and shapes. Hence, please stick to purchasing a weighted vest specially made for women. Unisex one’s must be avoided. 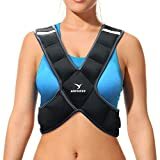 What to look for while buying a weight vest for women? ​Many factors must be kept in buying a weighted vest for woman. Comfort- This is the number one thing to keep in mind. You would not want to buy a weighted vest that is not comfortable to wear. Weight Level – The main advantage of a weighted vest is that most of them are adjustable. This means that you can exercise at many difficulty levels just by adding or removing weights. There is no fun in doing easy exercises. Right! Looks- If you are going out for exercises then make sure the weighted vest looks decent. All the below vest won’t disappoint you regarding looks. Adjustability- You should buy a weighted vest that is adjustable. This way you can always level up your fitness game without buying a new one. After a lot of research, I have listed below five of the best weighted vest for women money can buy. The first weighted vest we got for you is from RunFast. Not a popular brand but it does the job right. This is one of the few unisex one’s we have on the list. In my testing, it was quite comfortable to be worn by a woman. It also comes with wide straps which make sure you can have the best fit. It comes only in black colour. Sorry ladies :D.
The standout feature is the adjustability. You can adjust the weighted vest from 20 lbs to all the way up to 60 lbs. This means you just need to add some weight when the exercises become too easy to perform. You can save your money that you would otherwise spend on an another weighted vest. You can also play around with the weighted vest to get the best fit. You can customise the weighted vest according to your comfort level. It has a 4.3-star rating on Amazon. You definitely won’t be disappointed after buying this weighted vest. I highly recommend you to pick one up for yourself. It is quite value for money as well. This one’s design is different from the crowd. You will definitely look a pro after wearing this one. It slips on over your shoulder in a position of comfort. Overall it has a slim design. The straps are quite adjustable as well. It is also quite easy to strap around your stomach. It comes in a nice black and purple colour scheme. You can get either the 10lbs or the 20lbs vest. The overall design makes it quite light. You can definitely wear this inside a large t-shirt without any issues. The lightweight build is a great advantage which can’t be ignored. It has a good 3.8 rating on Amazon. If you are just beginning then this may be just the right pick for you. This little hot pink weighted vest from Zeyu is a beauty. You will find hard to get your eyes off this beautifully weighted vest. It’s perfect for those women who are looking for light toning and cardio exercises. It maxes at 8 pounds. So if you are looking a weighted vest to make muscles, you are better buying a different weighted vest. The fit is fantastic. The straps make sure it is cinched tight around the sides. The fitting is way better compared to its competitors. If you are looking to do light exercises, you can’t go wrong with this one. With a 4.1 rating on Amazon, people have loved wearing this weighted vest. Note: This weighted vest is not for running or walking. It can be the perfect gift for your girlfriend :p.There is also a blue and a yellow variant case you don’t like the pink colour. There is two variant- one maxes at 8lbs and the other one at 4lbs. It might be just enough for most people. This one is designed like an X. It looks cool. It is cool for morning walks and cardio. It is one of the most affordable weighted vests out there. Perfect for a beginner. It has closures on both sides to secure a perfect fit. There is also a handy pocket that can be used to keep your phone or keys. It is quite comfortable to use. It provides you with a snug fit. A 4.5 star on Amazon speaks a lot about this cool weighted vest. You can pick up this one in either black or navy blue colour. Hope you like our best picks for women weighted vest. Do let us know if you have personal recommendation. Also, check out other weighted vest benefits and reviews.